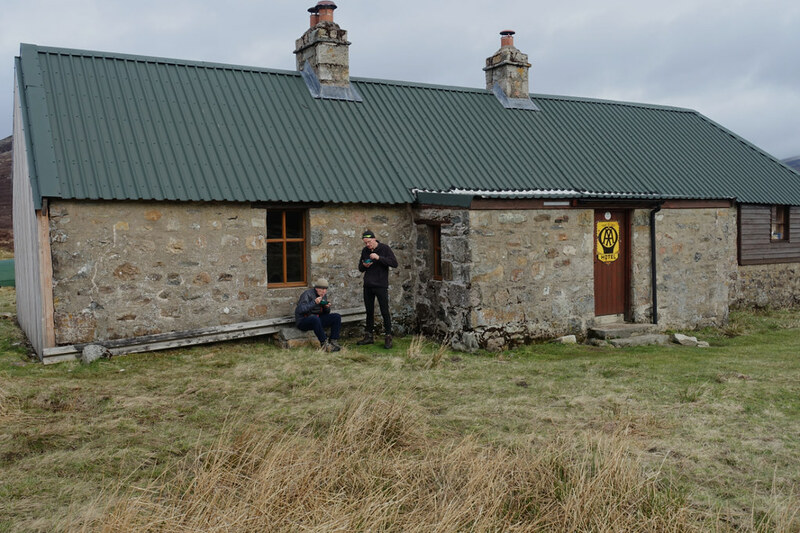 Having got back into wild camping last year on South Uist I was thinking about a trip this May when I saw the Gay Outdoor Club were having a weekend meet based at the Feithe Uaine bothy ( Tarf Hotel). A look at the map and a couple of accomodation bookings later and I had a trip planned with 2 nights in Perth, 3 nights wild camping and 2 nights at a great B&B in Newtonmore where I'd stayed before. This allowed me to get there and back comfortably on buses and trains from Norfolk. So on the Thursday evening of the early May bank holiday I arrived in Perth. Two nights at the Premier Inn were nicely comfortable without breaking the bank. 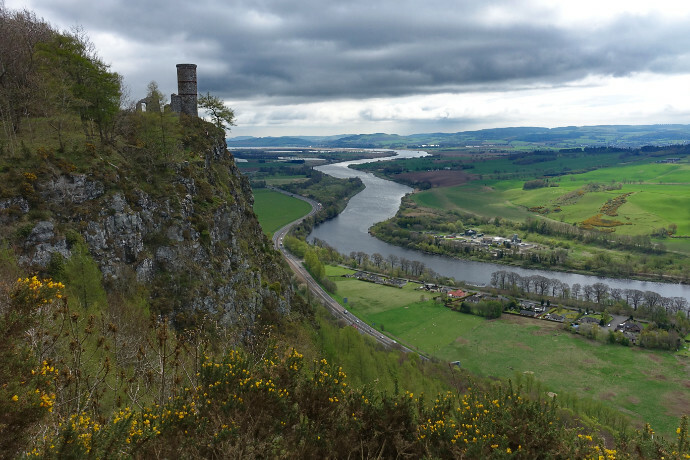 On arrival my pack weighed just under 14Kg so on the Friday I thought I'd have a warm-up walk with a bit less than this so wandered around Kinnoul Hill leaving tent and food behind. 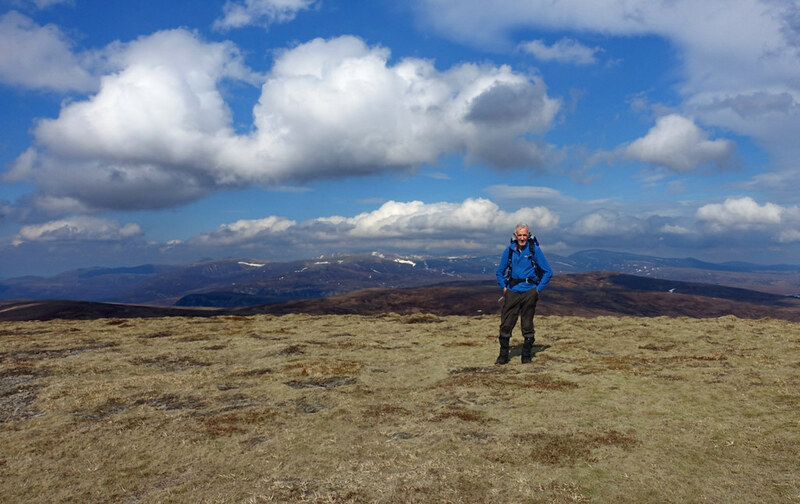 It was a really nice walk with great views over the Tay and north to the Highlands where, ominously, Beinn a'Ghlo never emerged from the cloud. 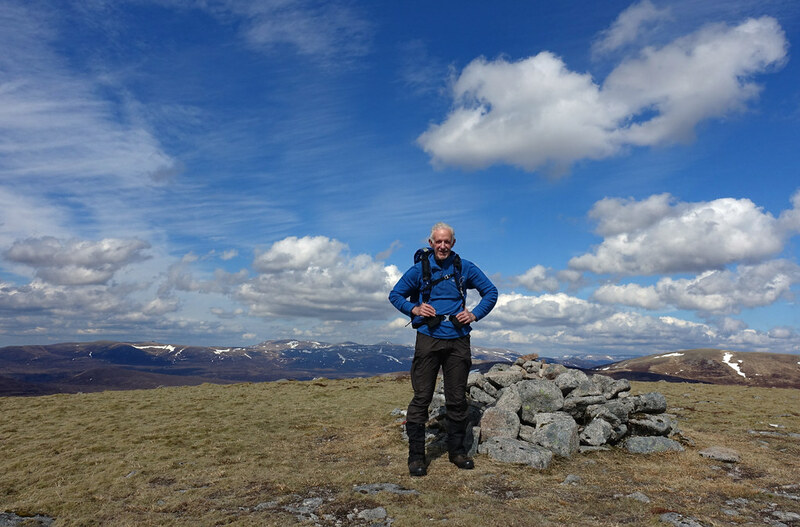 The plan was to walk in to the bothy over Carn a'Chlamain, camp nearby and socialise at the bothy then spend the Sunday walking over An Sgarsoch, Carn an Fhidhleir (Carn Ealar) and Beinn Bhreac and spend Monday and Tuesday making my way to Newtonmore with another nights wild camp, route depending on the weather. Saturday morning saw me catch the train to Blair Atholl and join up with the others. 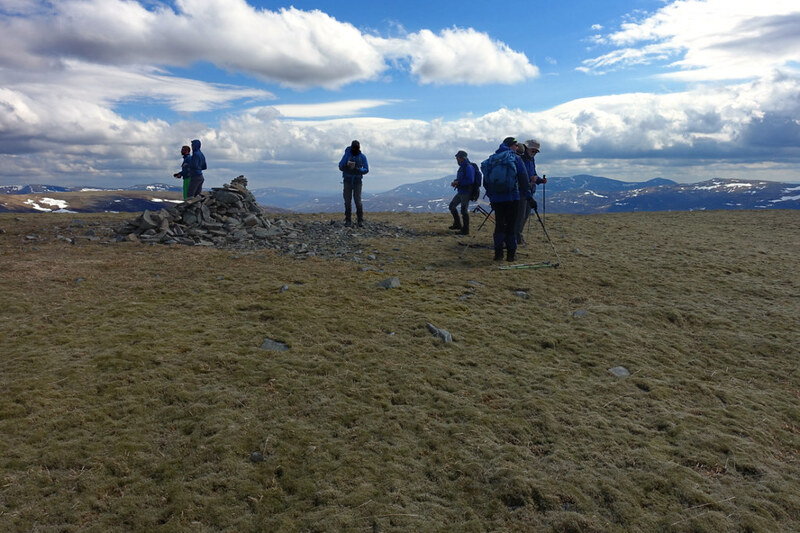 There were 6 of us setting off for the bothy and a number of others joined us for the walk up Glen Tilt. 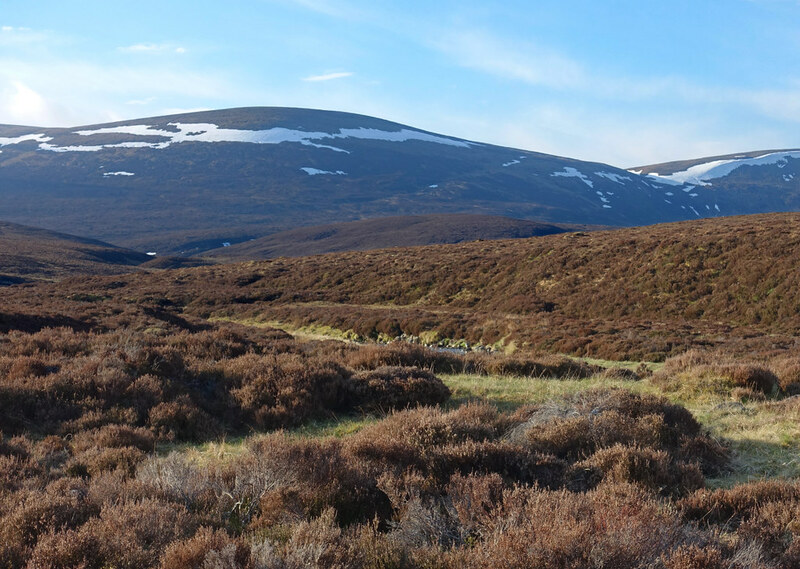 We followed the valley to the marble bridge then set off up the ridge to join the landrover track which goes virtually to the top of Carn a'Chlamain. 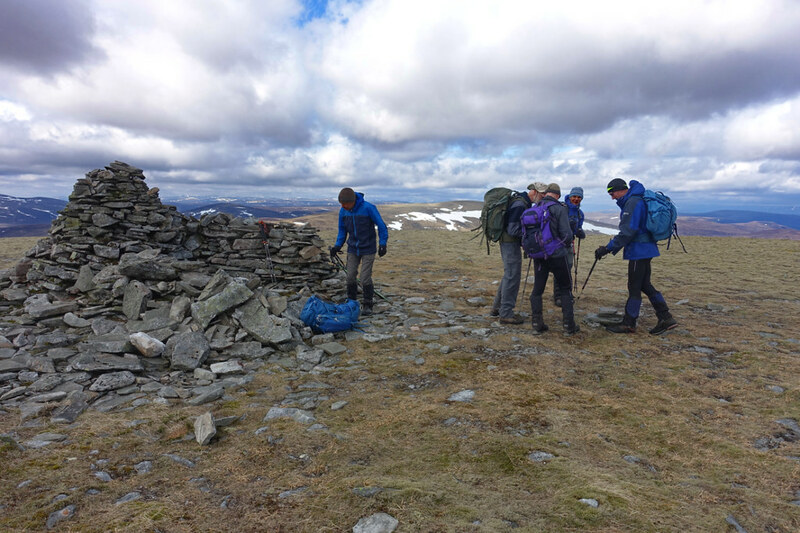 The initial climb was a bit steep with a fully laden pack. 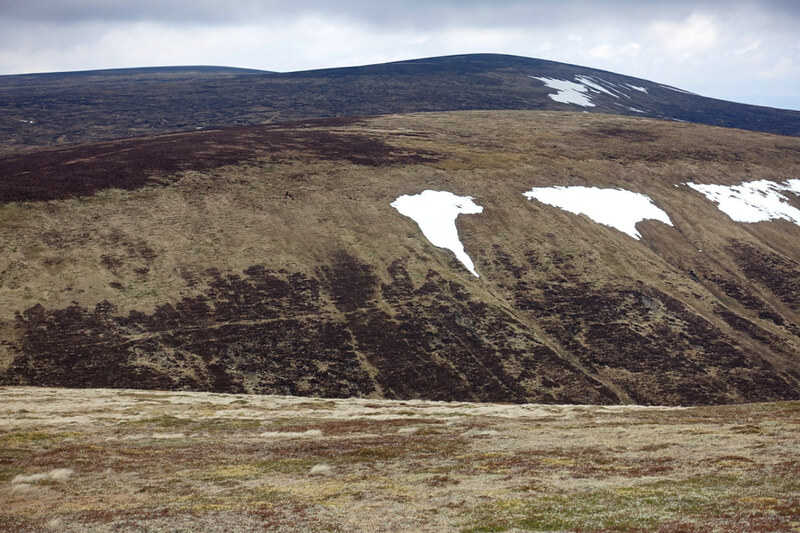 The cloud which had been down on the tops when we left Blair Atholl had now cleared. As we were a bit late in the day we saw several people returning and a couple of people we met said they had seen nothing when they were on the top. A steady plod up the track saw us at the top by about 3.30pm. It was difficult trying to stand up to take a picture as the wind was blowing hard over the summit. 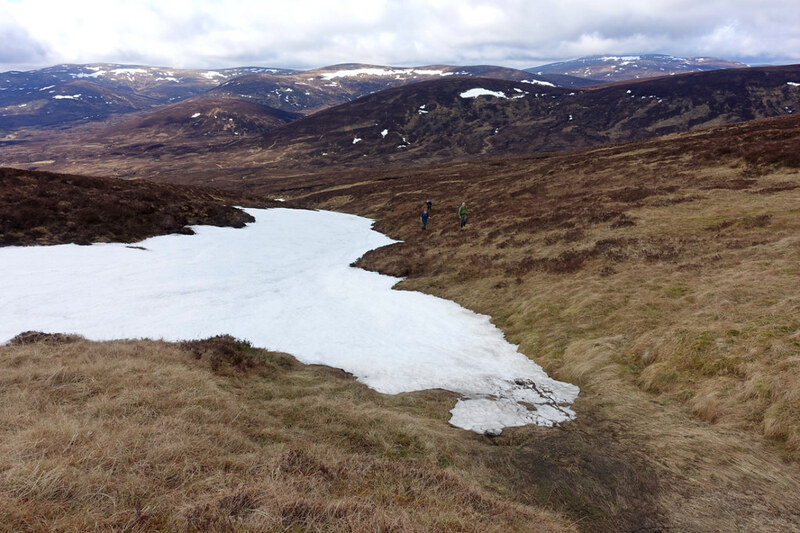 It took only about half an hour to descend to the bothy over the odd snow patch and unnecessarily crossing the Allt Feithe Uaine by choosing the wrong bank of the feeder stream. 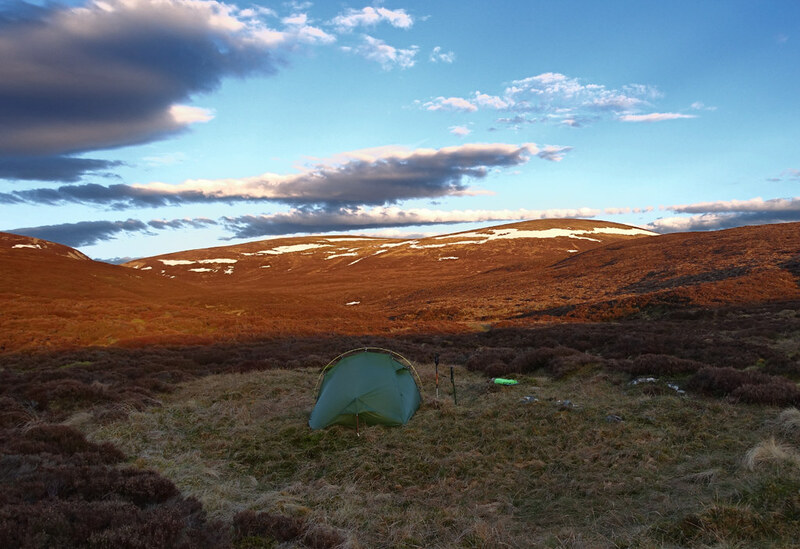 There were already some guys with a couple of dogs at the bothy but they made room for us and I and a couple of others pitched our tents nearby. I didn't get much sleep because of a stiff breeze causing my tent to flap noisily - a major drawback to my lightweight tent. 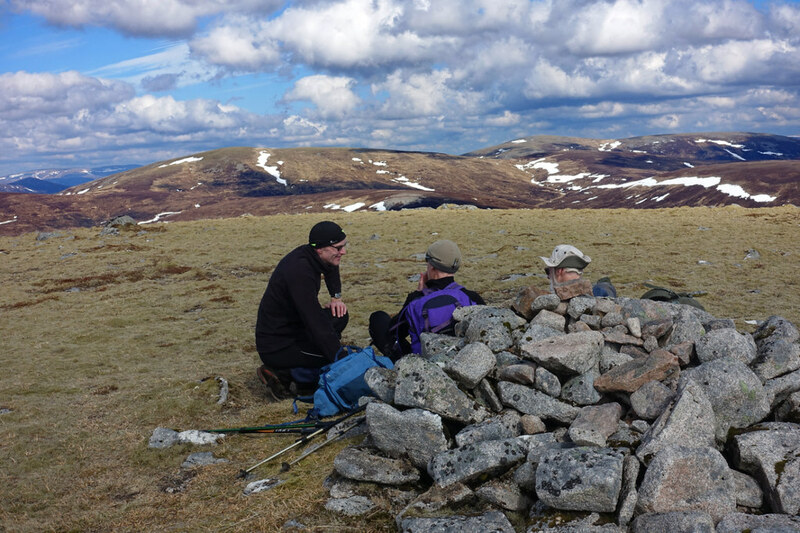 The intention today was to do An Sgarsoch, Carn an Fhidhleir (Carn Ealar) and Beinn Bhreac and return to the bothy for the night. So we didn't have to carry all our kit. But first we had to cross the Tarf. I bought a pair of lurid blue and yellow boat slippers which were good for the job. Others crossed in socks or waterproof sandals. 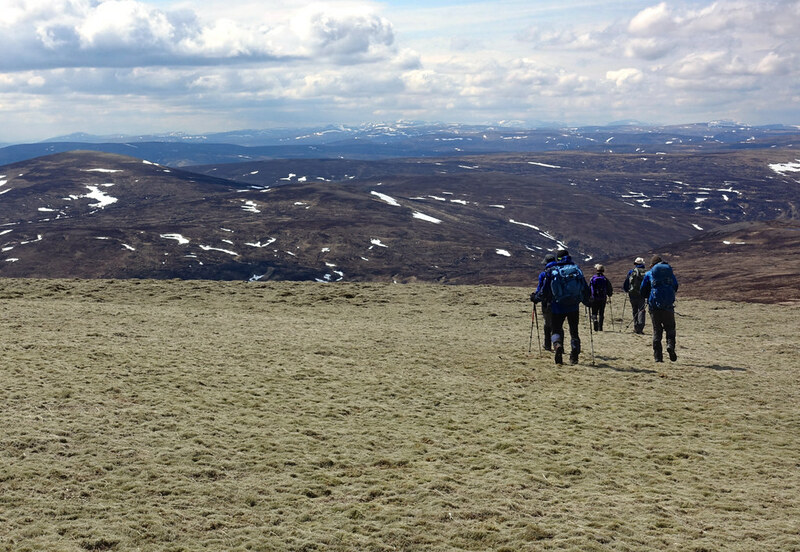 It was a straightforward ascent up by a burn to a col and then along the ridge to the broad rounded top. The tops were clear by now and the views extensive to the north and east. Back down to the Tarf, Beinn a'Ghlo behind. 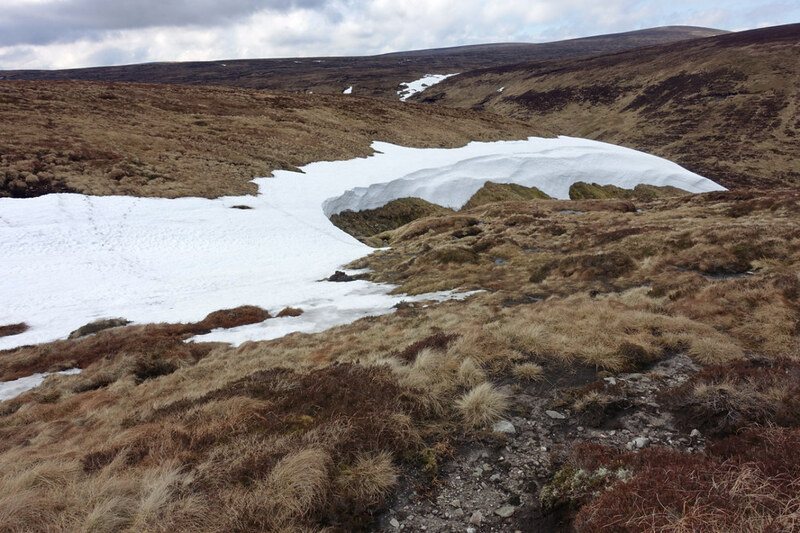 Quite a few snow patches in gullies. 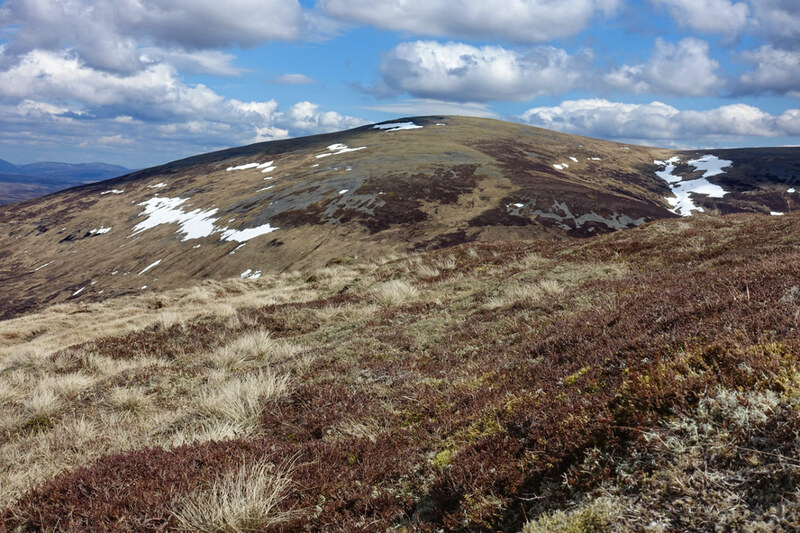 There was then a fair drop to the col between An Sgarsoch and Carn an Fhidhleir and a climb up the other side. 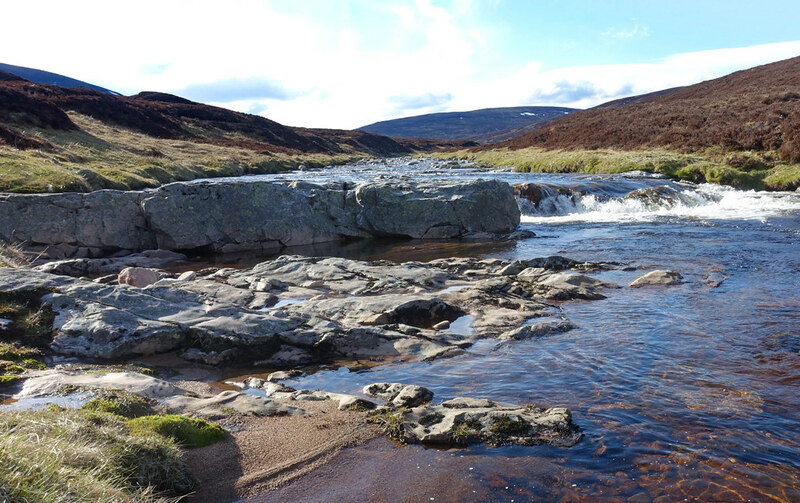 Met an orange clad walker here who'd come in from the Lin of Dee. We had a short break before the next summit and were overtaken by a couple of young guys who were not only faster but seemed to need less clothing! 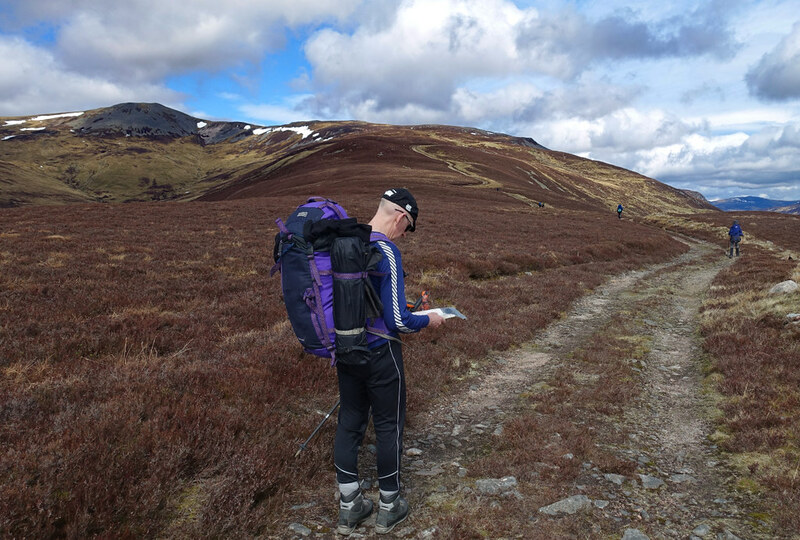 Navigation was very easy today with no cloud down and good visibility so we just headed towards Beinn Bhreac in an arc trying to avoid losing too much height or getting into peat hag territory. Saw another walker here, a lady with a pack who seemed to be wearing wellington boots and shorts! Summit Beinn Bhreac looking back to Carn an Fhidhleir and An Sgarsoch. 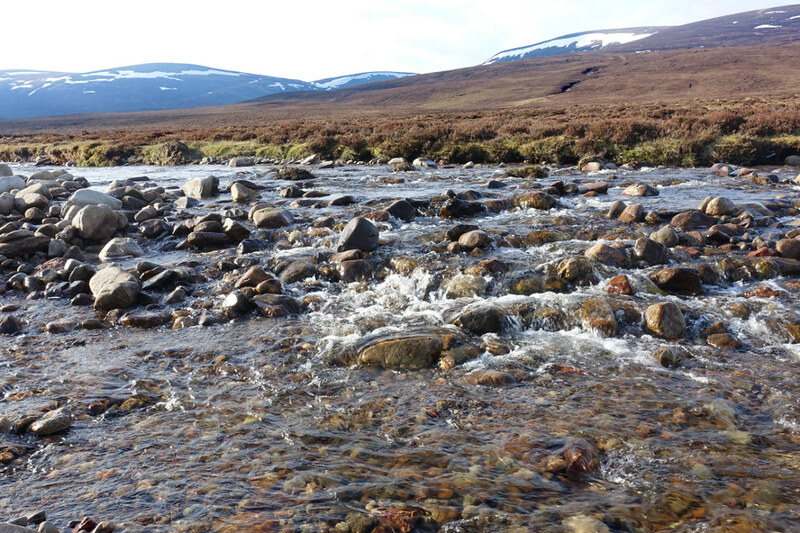 There was still about 8Km and a river crossing to get back to the bothy. 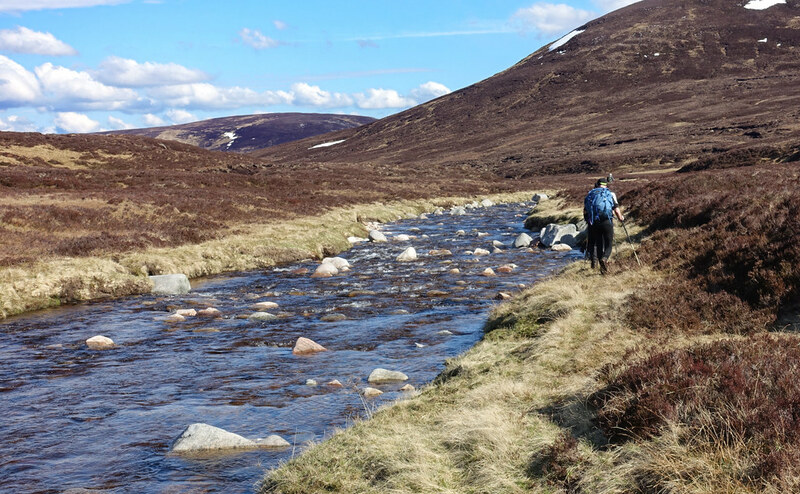 While the river was delightful with common sandpipers piping away every few minutes and frogs leaping away from our boots regularly, it became a bit of a trudge. 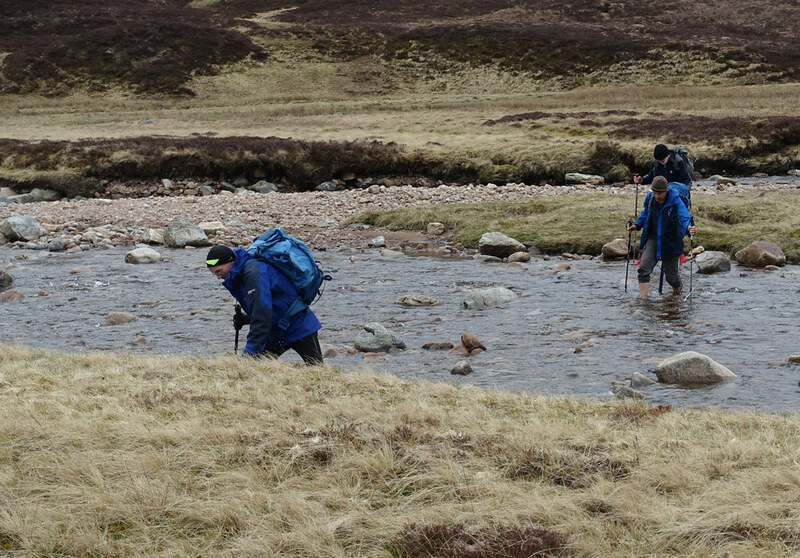 A couple of times we had to climb away from the river where a slope had been eroded and there was no easy low level way past. It was a relief to be back and the other guys and dogs had left. 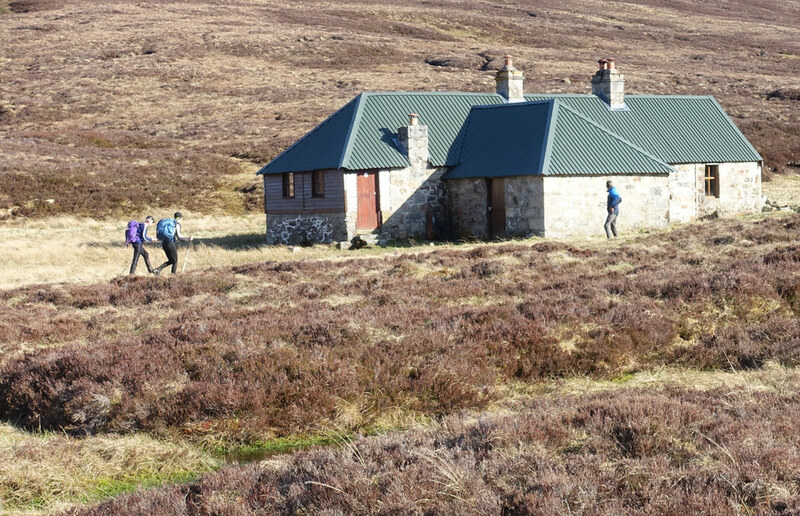 When we looked at the bothy book we were taken aback to read their entry (paraphrasing) ' We spent the night as usual smoking weed and telling fart jokes. A group of old men arrived and weren't very friendly and looked as if they might kick off at any time'. Well I am an old man so didn't mind but some of the others who were barely 50 were not amused. As for kicking off - I don't think we even had a football between us! I got a better night's sleep as the wind dropped. So got up to a mild, calm morning with just a few midges about. The sky to the south soon looked ominous though and cloud was down on the hills. After yesterday's trudge along the Tarf I was hoping for the cloud to lift so I could enjoy a high level, and easier, route westward. Had breakfast with the others at the bothy and managed to get the tent down and packed up in the dry. 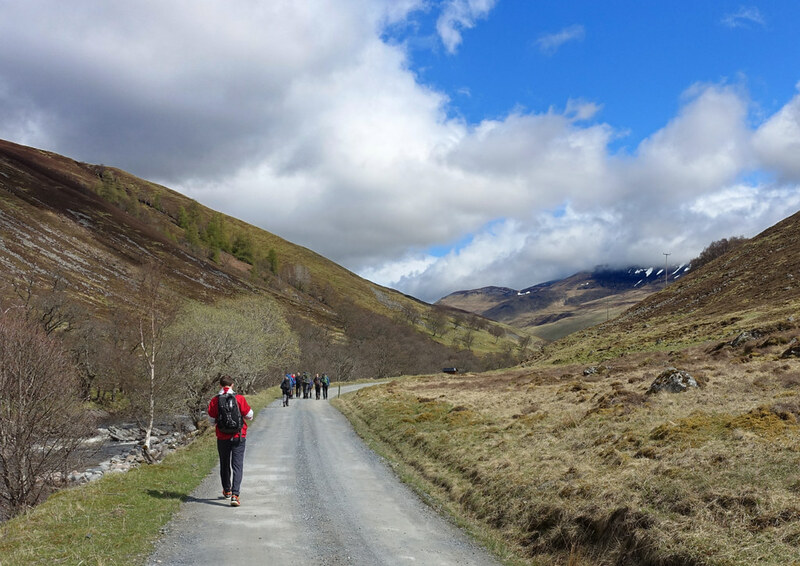 We said our goodbyes and they headed back to Blair Atholl while I set off up the Tarf again. I must have got a good half mile when the rain came on so it was on with the waterproofs and pack raincover. I passed the little waterfall again where the river was noticeably lower - showing , I guess, that much of the flow was snowmelt which had slowed down overnight. Less flow over the fall this morning. 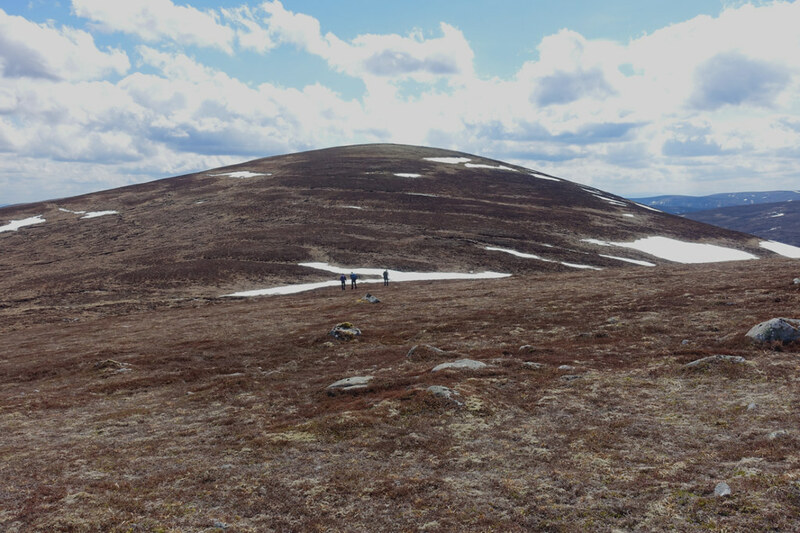 My first objective was to pass the point where we had come down from Beinn Bhreac and crossed the Tarf yesterday - then I'd be in new territory. But somehow, in between daydreaming and watching my feet, I missed it and realised I was getting nearer the decision about high or low level route. Getting a bit boggy near the watershed. 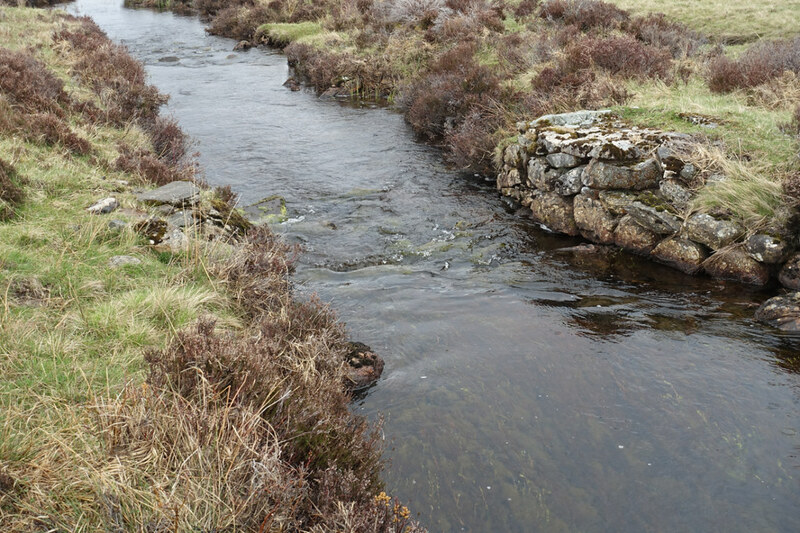 I'd taken to cutting off some of the meanders on the river as they were getting more extravagant. 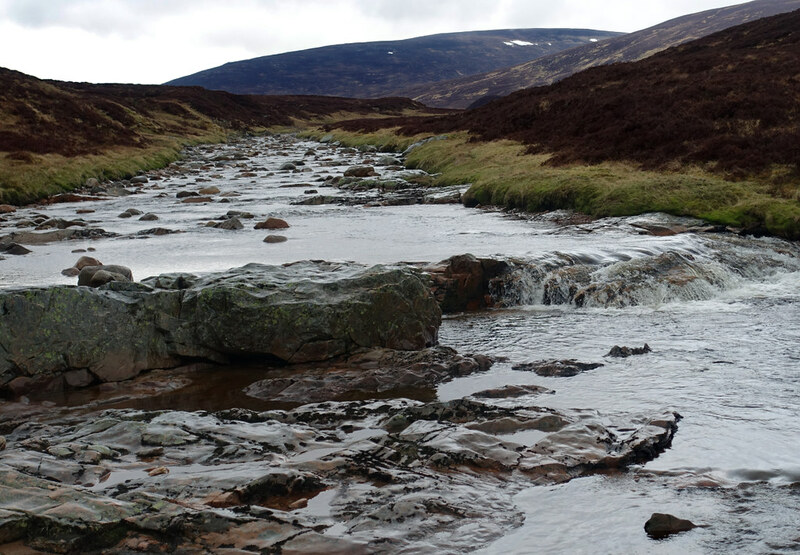 Eventually I reached the watershed with the Allt a'Chuil. The cloud now seemed to be above 800m and rising so, with some relief, I set off uphill away from the river. Last look back to the infant Tarf. I could now follow my planned route over towards Leathad an Taobhain and the top of the Minigaig pass. 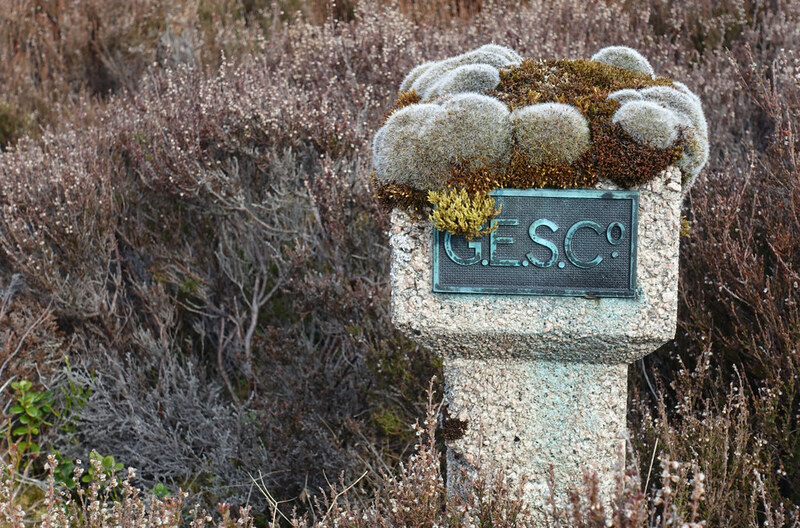 Above about 800m the heather died away leaving a surface of lichen, moss and gravel which made for really nice walking - though it seldom lasted long before a descent into boggy bits or heather again. 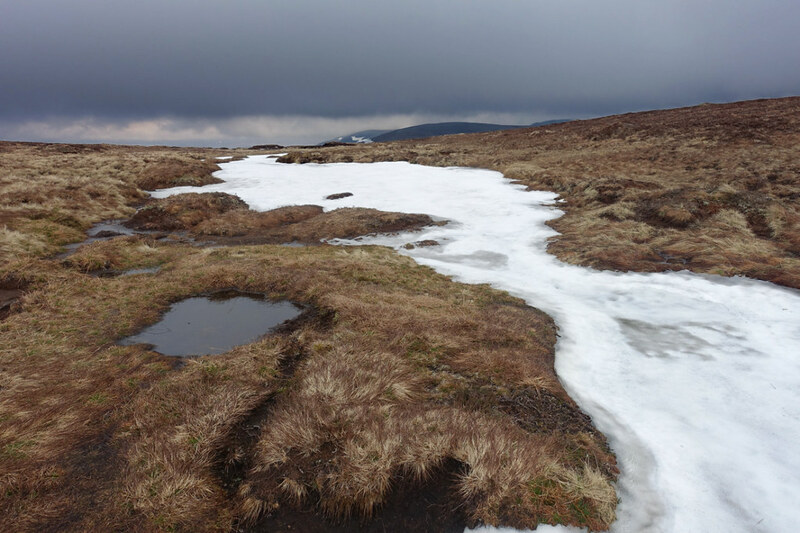 Quite a few of the boggy bits were filled up with melting snow and I was a bit cautious about what I would cross. Didn't fancy breaking through into a soggy hollow on my own with a pack on my back. 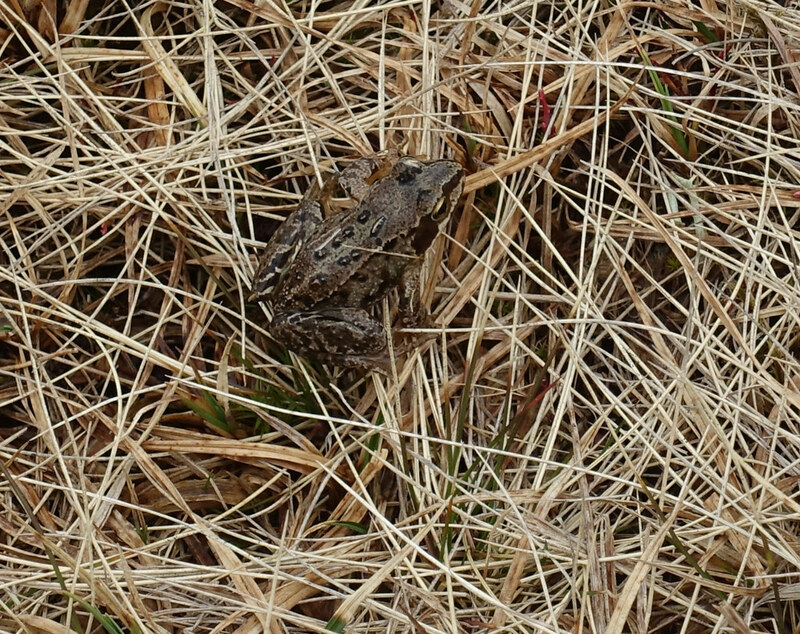 Altitude didn't seem to affect the abundance of frogs - just a bit of damp grass. Got to the point marked 859m and the view to the north opened up. 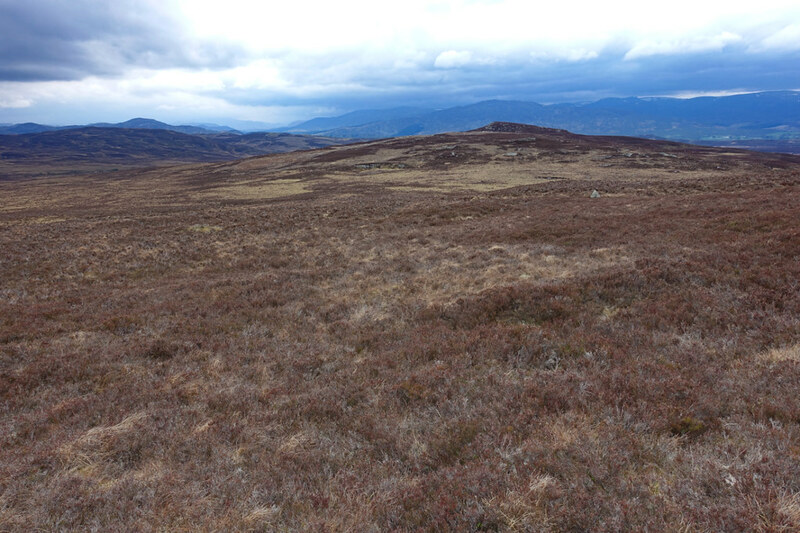 There was a steep valley between here and Leathad an Taobhain so I contoured around to avoid too steep a drop. Leathad an Taobhain now visible top left. The way ahead lay across a snow filled gully or was blocked by a big drift. 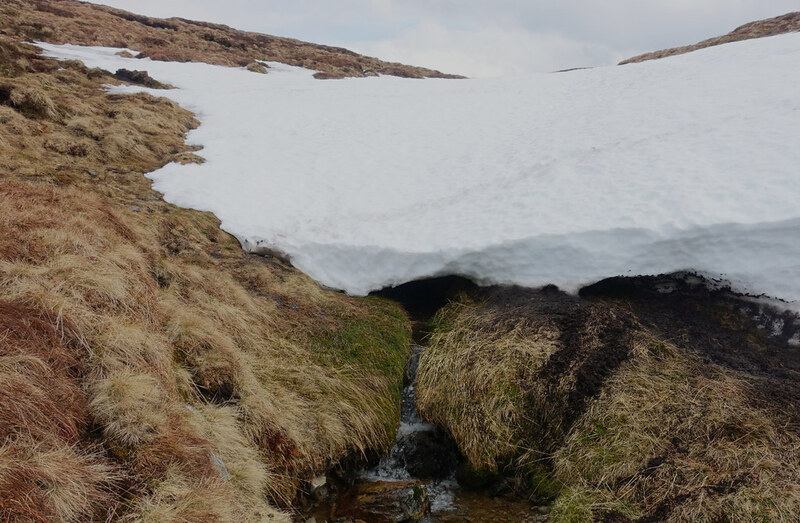 There were a few set of footprints crossing the snow but I had a look at where the stream exited from under the snow before deciding it was ok to cross. Stream emerging - several feet of snow above. 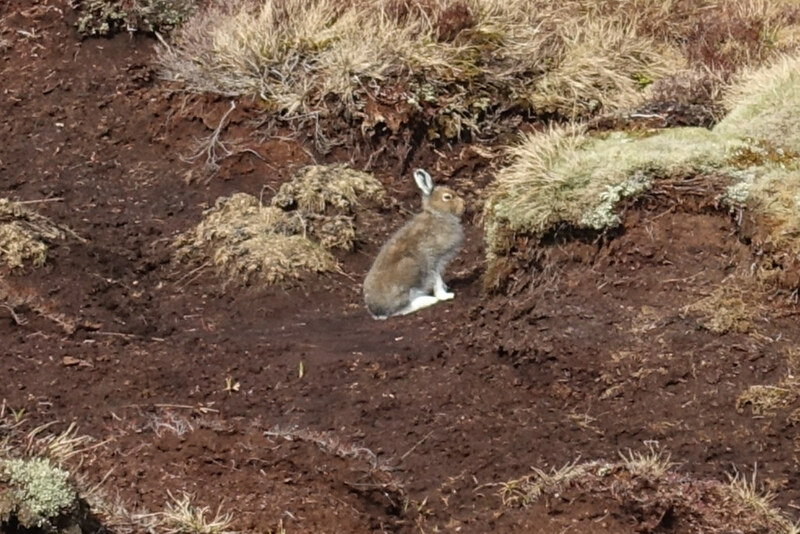 Soon after climbing out of the little valley I saw this mountain hare while crossing some peat hags. 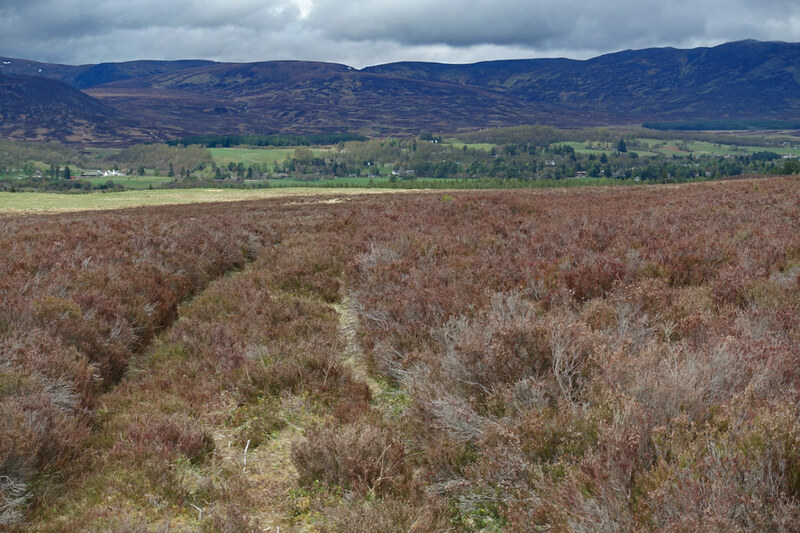 Once above the hags and heather it was back to good walking on lichen etc and even signs of a path. Then I was at the top of my second Corbett on the trip, both in the top ten by height but both pretty nondescript. 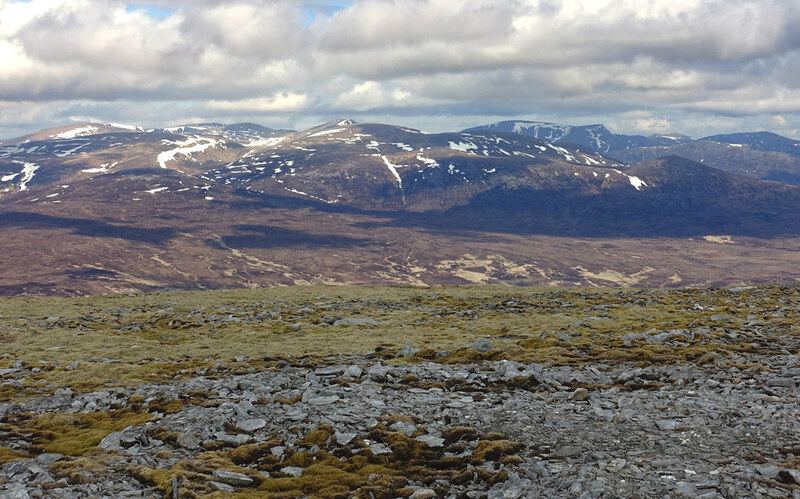 The view north to the Cairngorms was pretty good though. 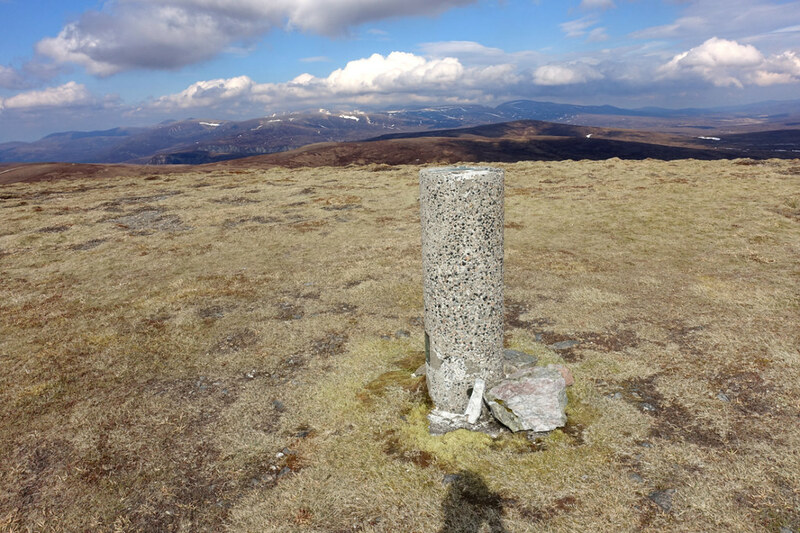 The trig point on Leathad an Taobhain, Cairngorms beyond. 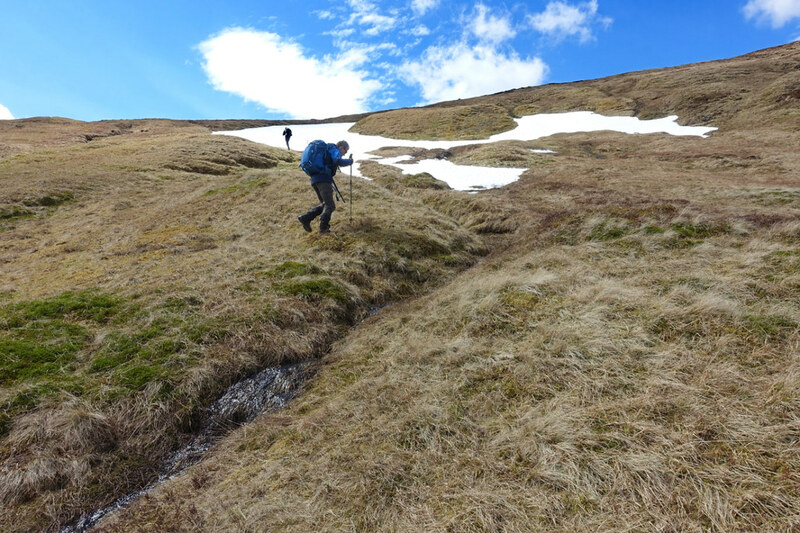 It was then a short descent, avoiding a couple of icy snow banks, down to the top of the Minigaig pass. 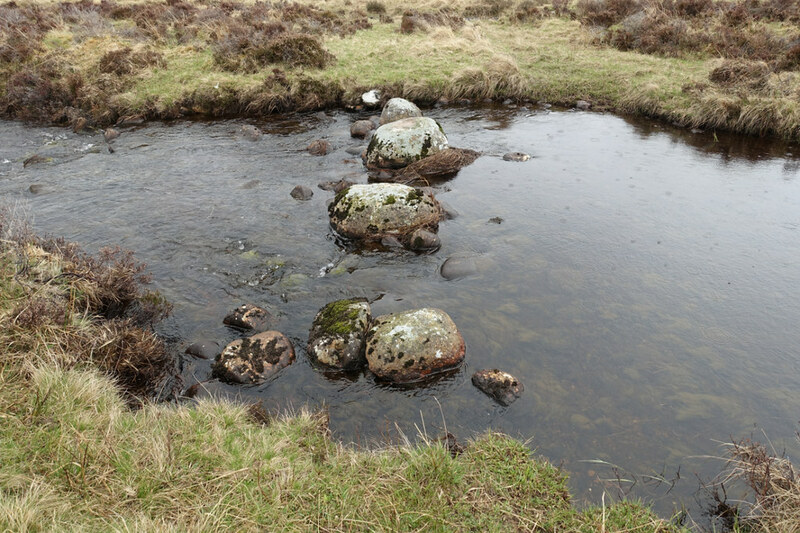 When I reached the Minigaig it was a great track and I set off with a renewed spring in my step - for a couple of hundred yards. This was definitely the only stretch of the Minigaig I saw that I would ride an MTB on. 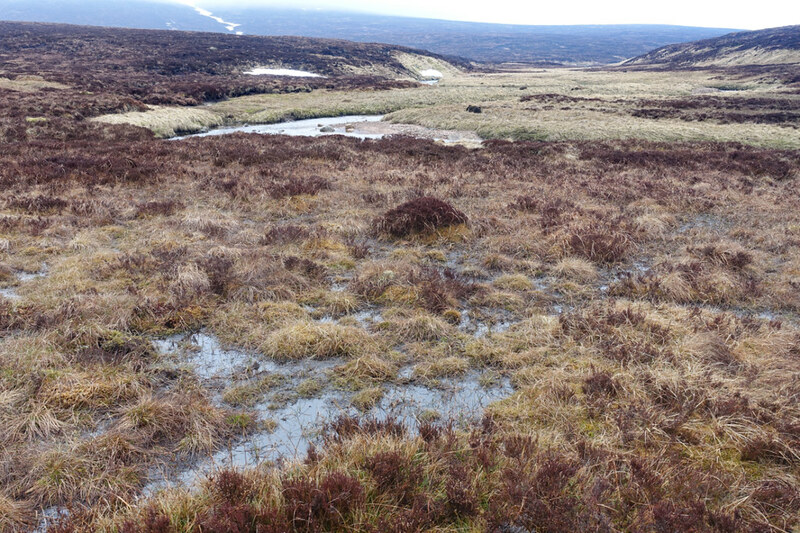 Within minutes the path disappeared into bog or itself became the main route for snowmelt off the hill. 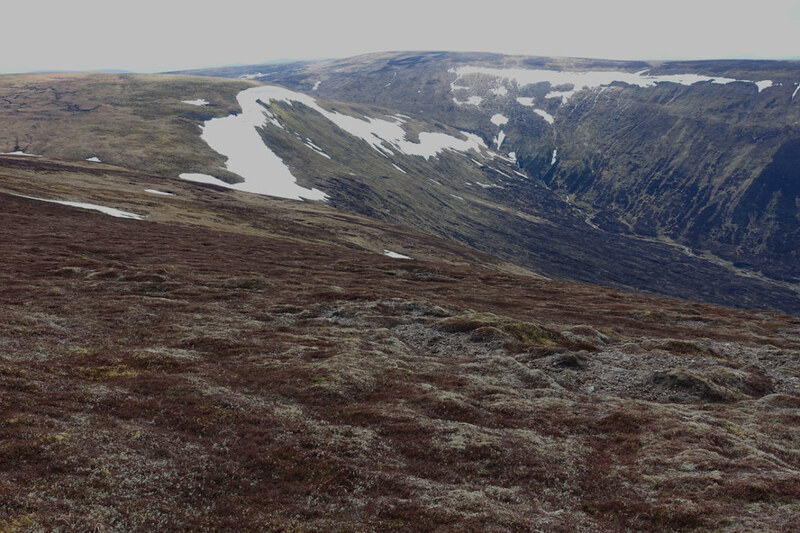 So I just splashed on for the next couple of miles, keeping the infant Allt Coire Bhran on my left. In fact this was one of the couple of times on the walk I used the GPS on my phone to see if I was anywhere near the path - I was, but there was little sign of it. Around 6pm I found a good spot to camp near a side stream and put up the tent. Having a cuppa after pitching. It was a pretty idyllic spot, on the site of an old shieling and I managed to get all my pegs in ok, bar one which had to go in at quite an angle. Late evening in a great spot. Although it was pretty calm when I turned in the wind soon got up leading to a fitful night's sleep. Sometime around midnight the poorly anchored peg came out and the end of the tent flopped onto my face. I got up and used one of my walking poles as a much better peg - reaching beyond the rocks to get a better purchase - ought to consider this in the future where a rock prevents a good peg position. Anyway, I got up at 5.15am to a beautiful morning and somehow managed to while away over an hour getting ready before setting off at 6.30am. 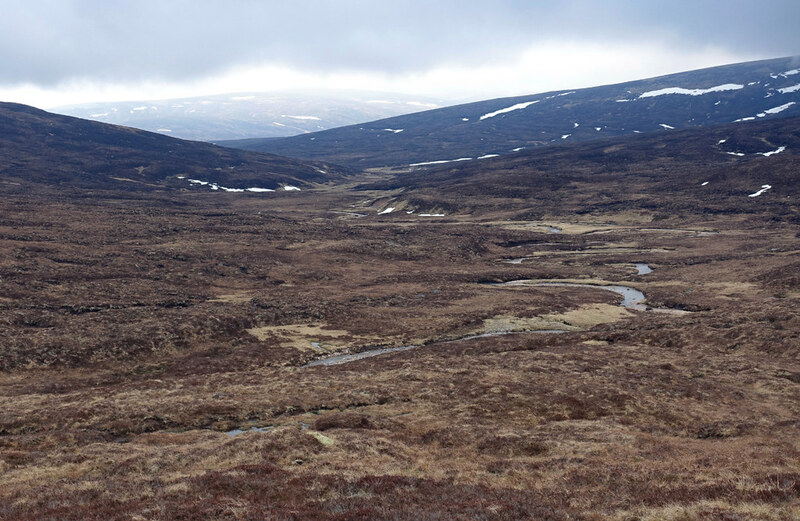 I just had to descend into Glen Tromie, cross the river and then the moors to Newtonmore. Early morning by the camp spot. Last look back to the Minigaig. 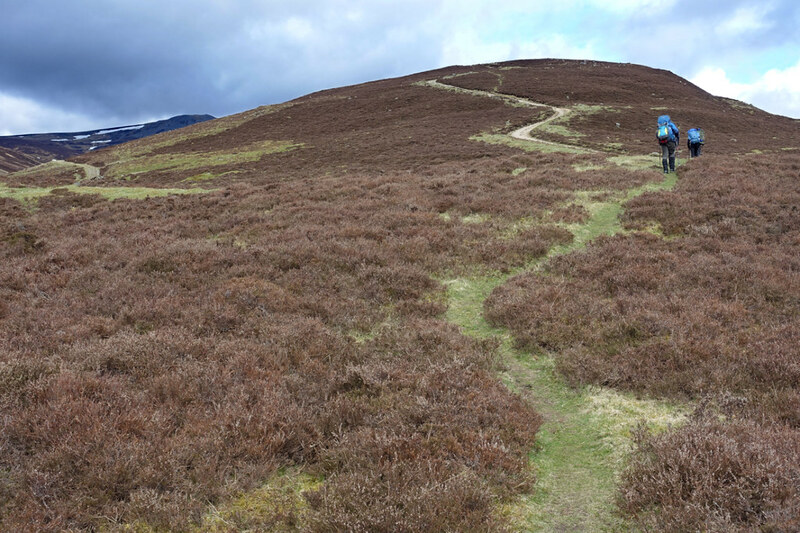 Path is more visible (diagonal climbing left to right in top centre) from here than on the ground. The hills in this area are pretty understated (boring to most?). This is made up for by the sense of space and emptiness. True, while out walking I (we) did meet 4 other people. But it was a fine bank holiday and these last couple of days I didn't see anyone until I reached the A9 at Newtonmore. But the thing I'll remember most are the rivers. 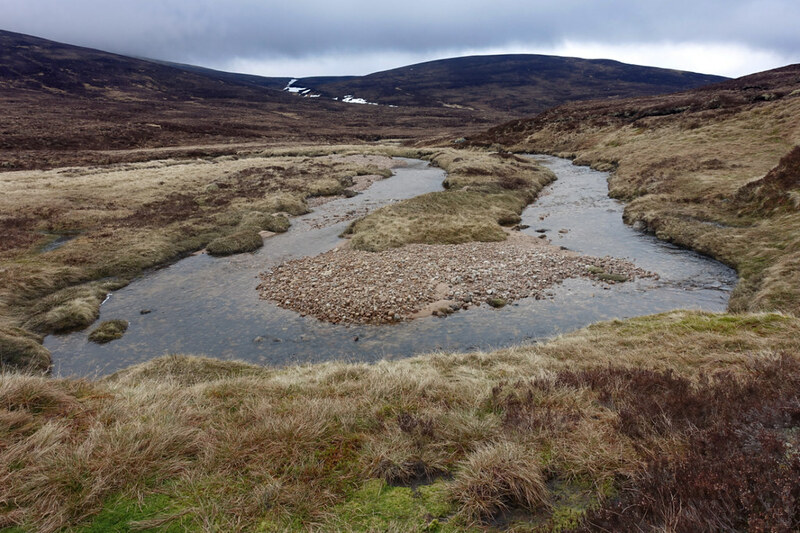 The Tilt, the Tarf, the Allt Coire Bhran, the Tromie and the many smaller streams were a delight to sit beside and listen to - though often a pain to walk along. This wasn't really the lasting memory I expected to bring home with me. 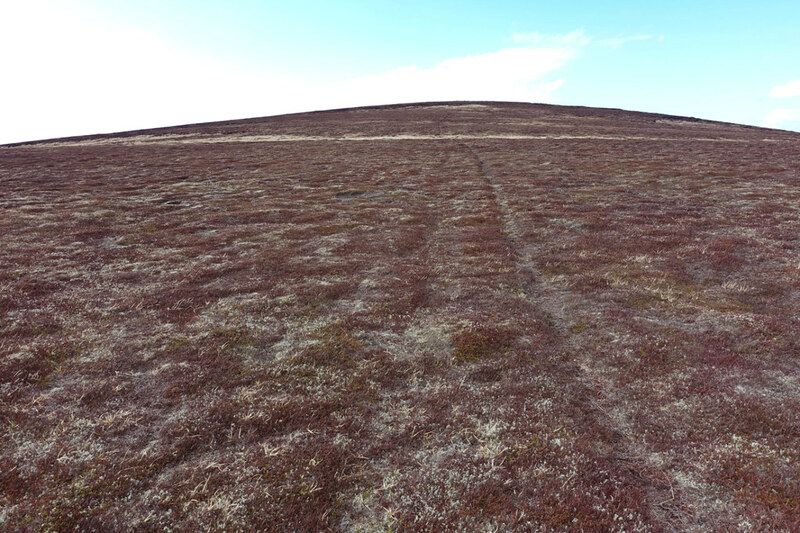 The path was mostly now just a deer trod through the heather or grass. But still worth following for ease of walking. I was really not expecting to see a snake coiled up at the side of the track, sunning itself at 7am. But suddenly there at my feet was an adder. A quietly as I could, I reached for my camera and focused. At that instant, it was off but I managed to get a shot of it slithering away through the vegetation. 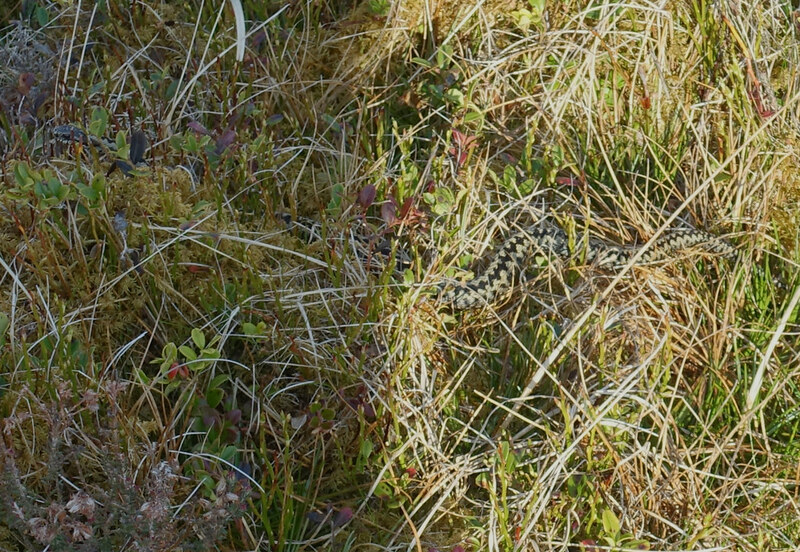 Adder - head is at the top left of the picture. 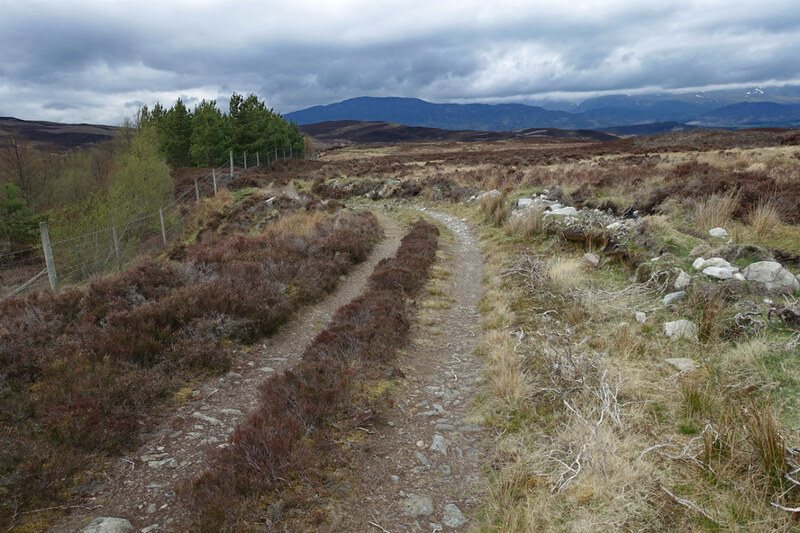 Although a private road, much of the track down Glen Tromie is tarmacked. Interestingly decorated marker post by the track. I knew the map showed a bridge at Dalriach. I knew I had read somewhere that it was sturdy enough to take shooting parties over on their transport. But I had the nagging feeling that I'd read somewhere that it was no longer there. The nagging doubt was right. The sturdy bridge pillars were there but only part of the wooden bridge was in place and another part lying in the grass. Not very surprised, I set off downstream looking for a place to wade across. The map seemed to show a wider and presumably shallower section further down. In fact, not too far down I came across a ford, nicely created for landrovers. Although a faff to remove boots, put on my boat slippers and reverse the process once across it was a nice break from walking. 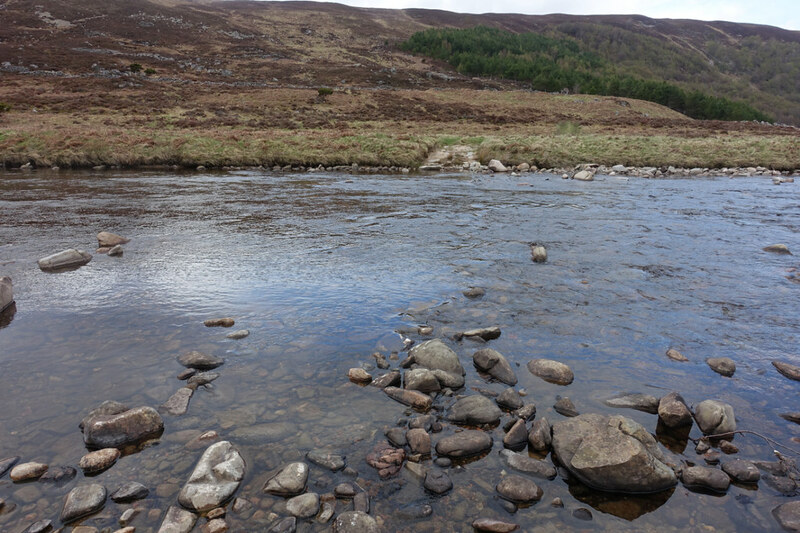 Strangely, although all the rivers must have been close to freezing seeing as they were mainly snow melt, they never seemed that cold on my feet. This ford came to just below the knee. I now climbed up onto the moor above the Tromie - the advantage of crossing here being I was in a gap in the deer fence which encloses much of this valley. The cloud was filling in now as I looked back up Glen Tromie towards the Gaick. Looking back up Glen Tromie. 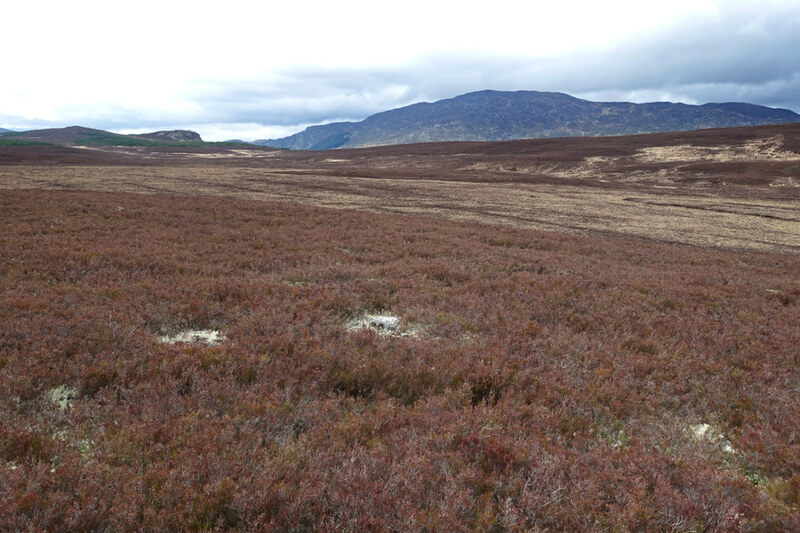 Ahead was heather moor, managed for grouse with a lot of recently burned patched to cross. It was only when I came across this little rock outcrop that it occurred to me that I hadn't seen any rock since Glen Tilt. 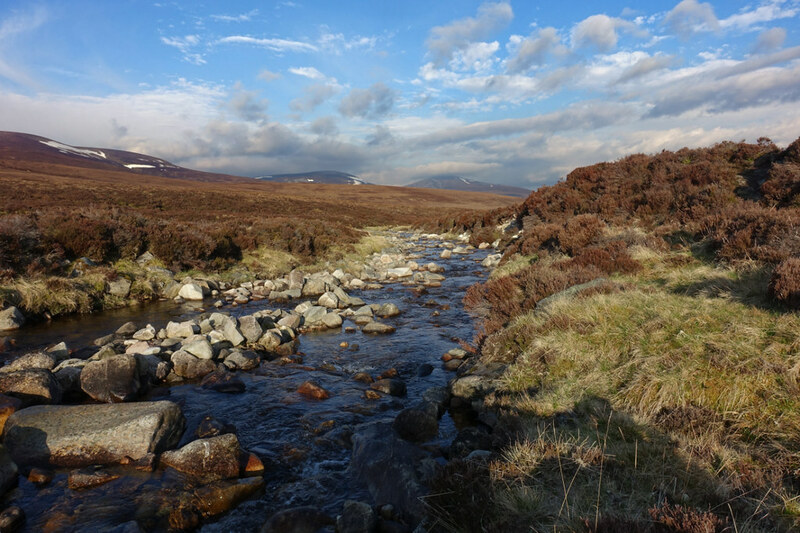 It also occurred to me that wildlife hadn't been that plentiful - lots of grouse calling and flying up noisily, golden plover, wheatear and meadow pipits on the hills, common sandpiper along the rivers, frogs and the adder. 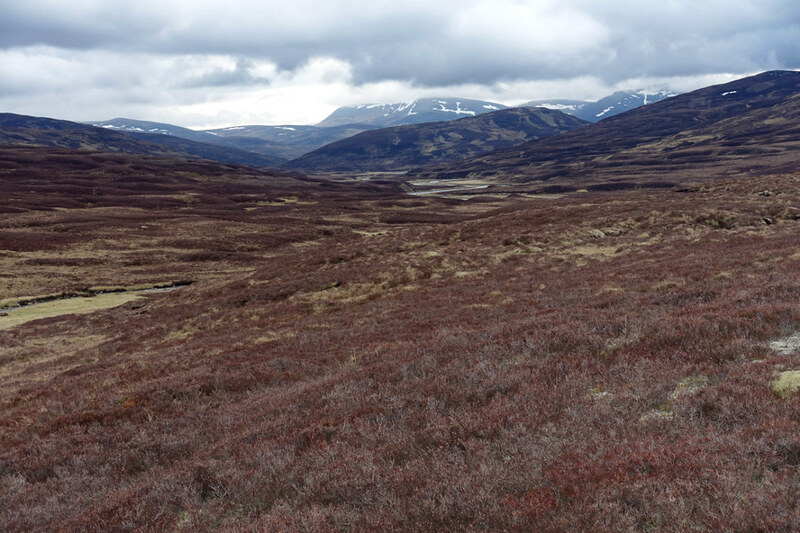 At this point I saw the first bird of prey of the walk when a golden eagle soared over a small hill and then passed overhead and off towards Glen Tromie. 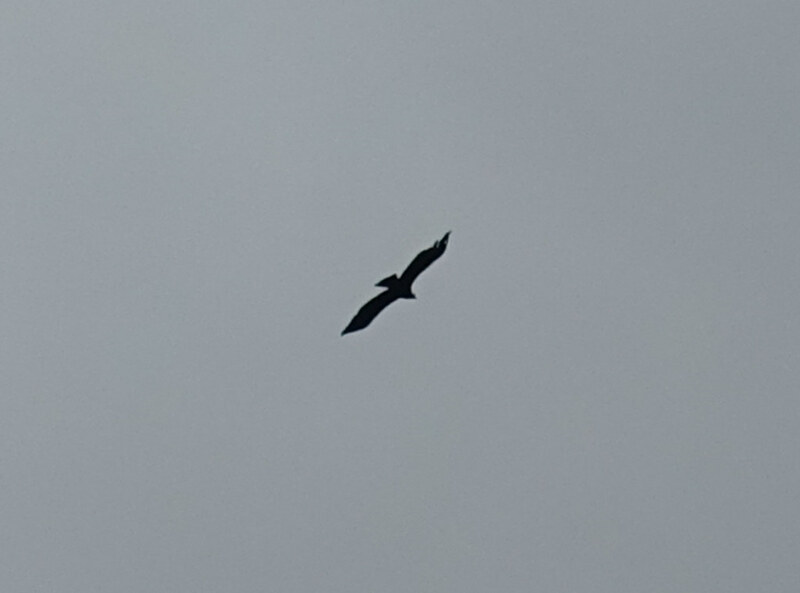 Usual picture of golden eagle in silhouette. 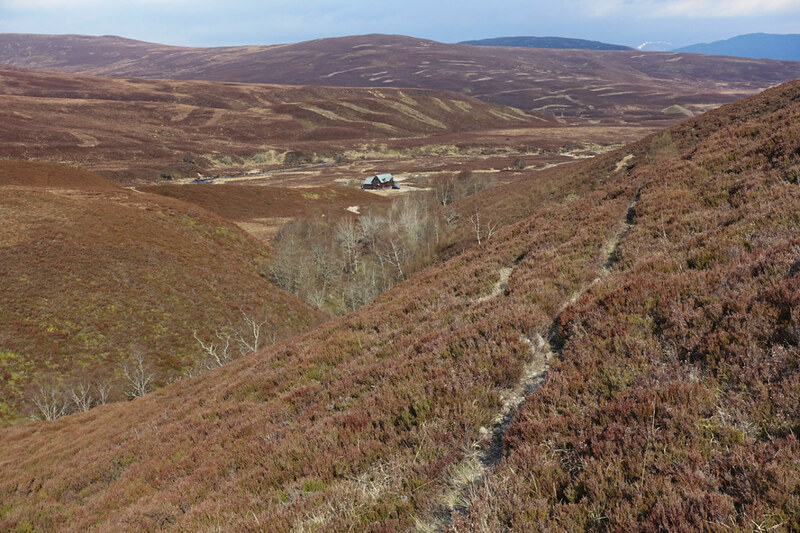 Because of the existence of a lot of deer fences on this moor I was trying to plot a course based on paths and tracks and footbridges on the map expecting to find gates in the fences there. I'm sure some of you old hands are smiling at this! Track , Craeg Dhubh beyond. Anyway, just after crossing General Wade's Road, on the path marked on the map, the path disappeared and this was the bridge. Fortunately there was a (newer or older?) alternative just upstream. Although there was no sign of a path I could see a gate through my binoculars and bashed across to it and found it operative. 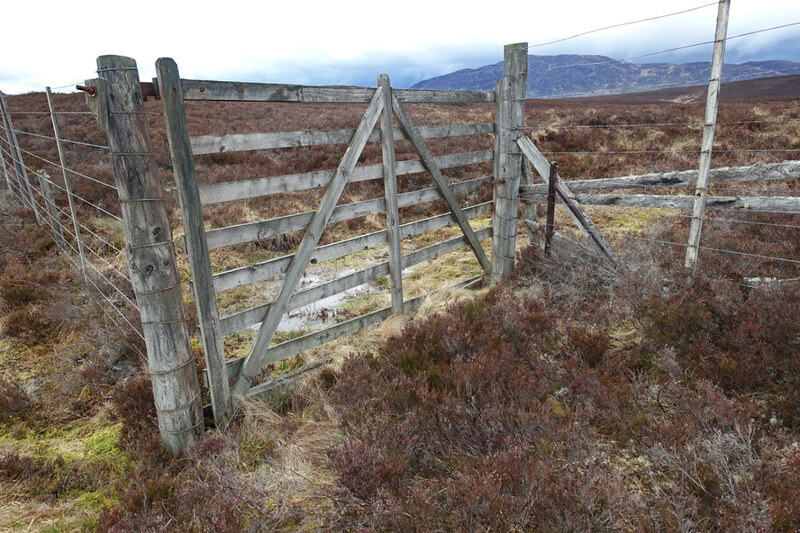 Operational gate in deer fence. 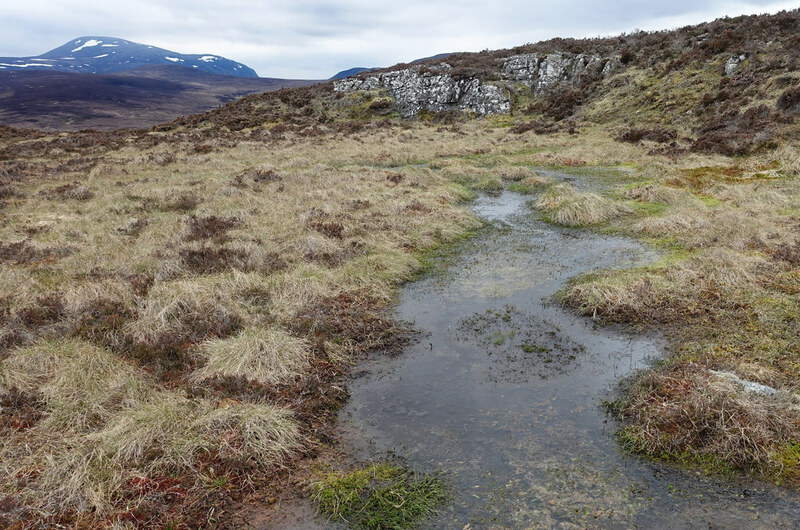 I don't know why I thought it was a good idea to walk over something called Nuide Moss but it was on the direct line to my final track and from here looked a bit boggy. 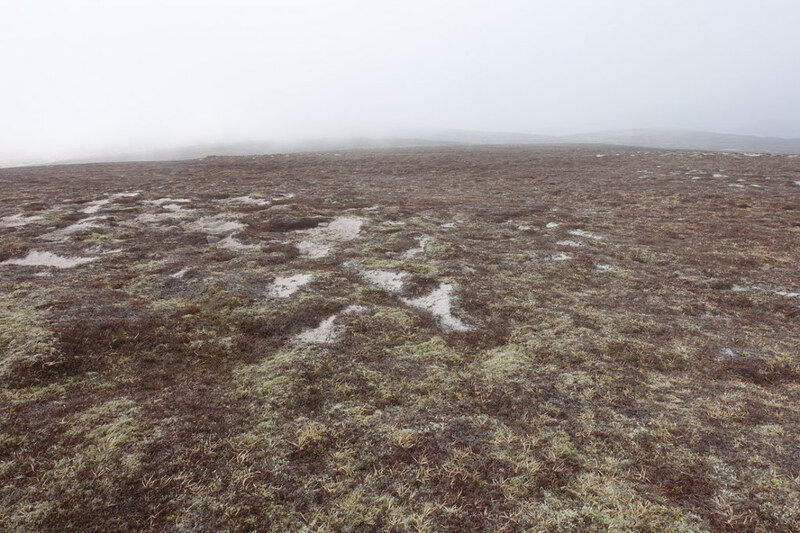 In fact it was wet and the heather on the higher bits pretty tough but not too bad. 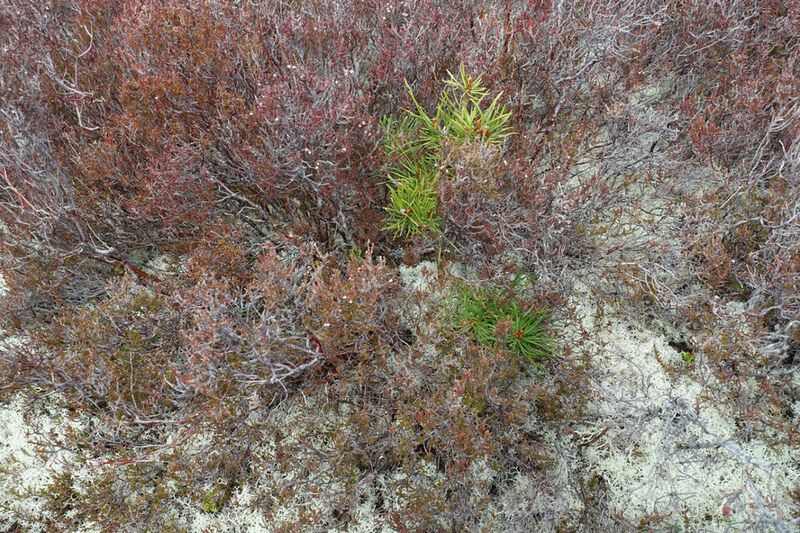 The value of the deer fence became apparent when, in a few spots I saw self set Scots Pine seedlings. 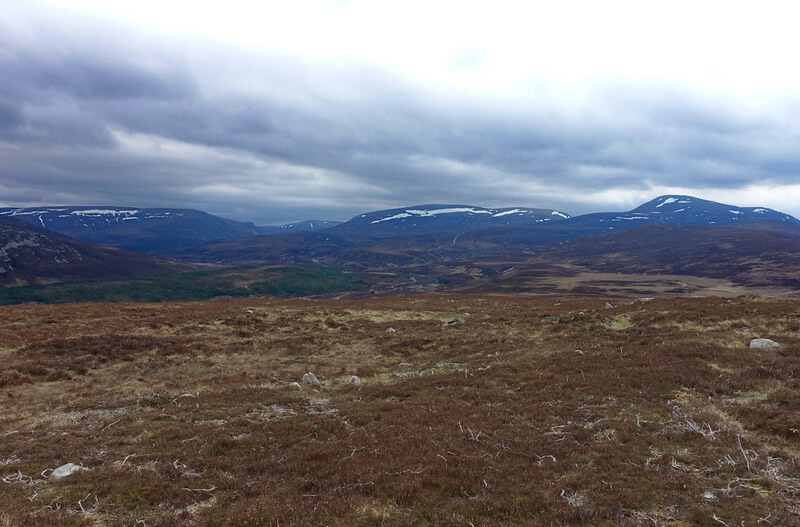 I got across to the track and finally Newtonmore was in sight. I got across the A9 easily (surprised at that) had a coffee at the Ralia Cafe and reached my B&B just as it came on to rain again. So I did what I set out to do. There were moments of great satisfaction separated by hours of trudgery. I was lucky with the weather. 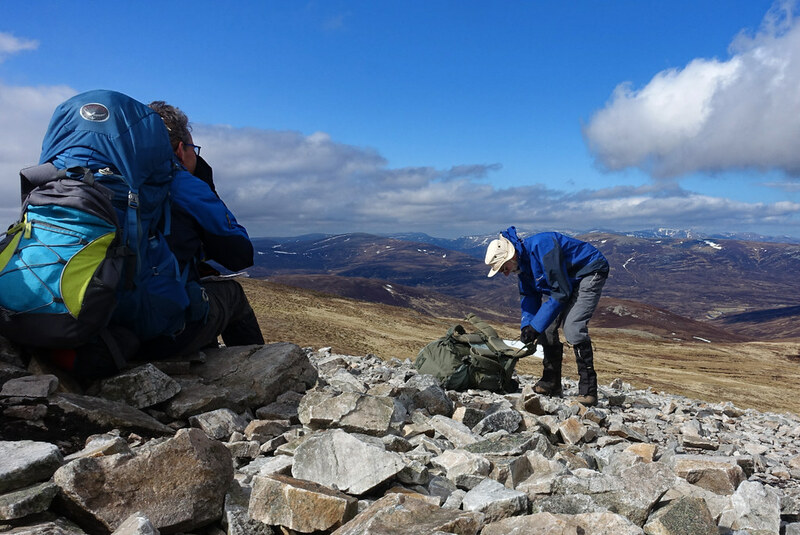 I also increased my count of Munros from 5 to 8 and Corbetts from 7 to 9. (you can see I'm not a bagger). There's a lot of satisfaction in a journey. 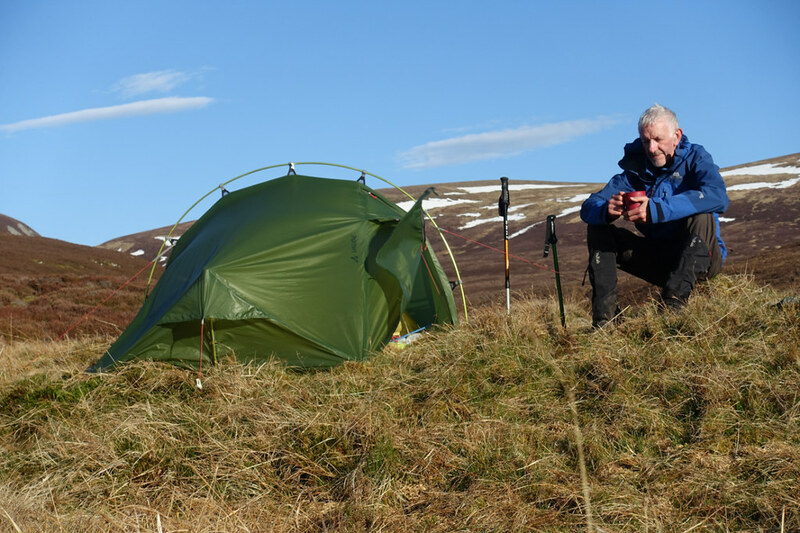 Tent Vaude Power Lizard 1/2 - very light and compact, easy and quick to put up, noisy in the wind, fabric stretches when wet so needs retensioning in the rain. Like all small tents suffers condensation when not windy and draughty when is. Sleeping mat Exped DownMat Lite 5 - love this, compact, warm, not too heavy, thickish fabric so quiet and fairly tough. Osprey Exos 48 pack. Light, right size for this type of trip, very comfortable for my 14Kg load. Stetchy pockets a bit flimsy and I already have a hole. Managed to make use of hip belt pockets (camera and PLB) and even one shoulder strap pocket (monocular). that was a lovely way to spend a few days, and the pictures are gorgeous. A fine few days out there. Enjoyed the read and great shots too. Looks like an excellent few days you had in the hills. 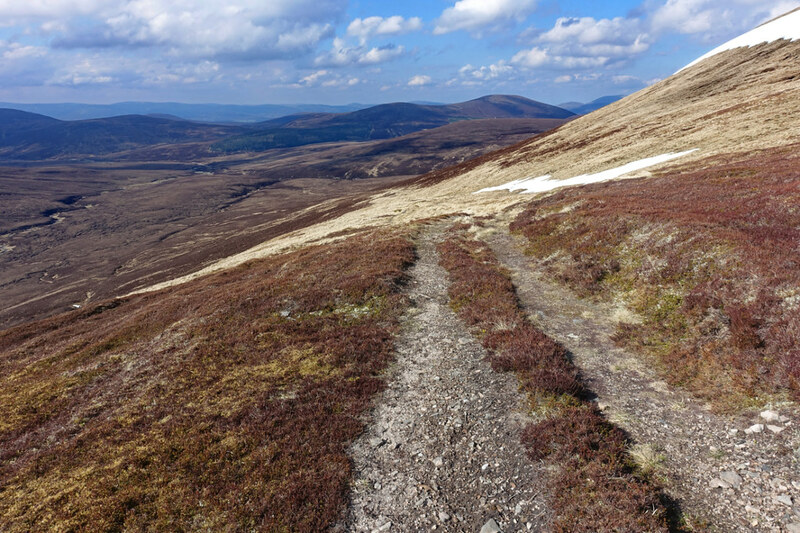 I remember pushing my bike along the non existent path at Minigaig and getting eaten by clegs one summer - it was a relief to reach the road back down glen Tromie! Looked like a good trip . 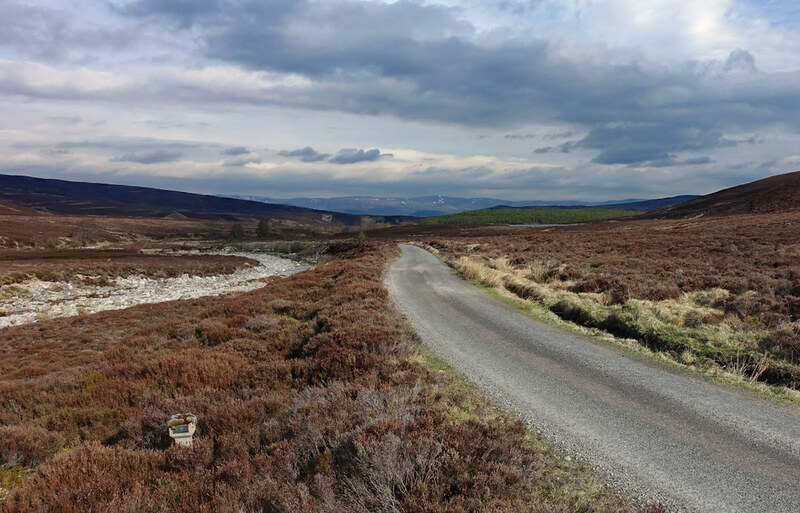 Not the most exciting hills, but the feeling of being out in the middle of nowhere is quite strong there, and as you say the rivers are impressive (the Feshie even more so, if you'd finished slightly further north).